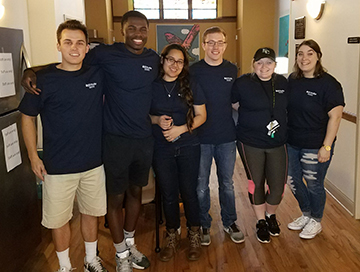 The Franciscan spirit of service with and for others is part of what makes Siena College distinct among liberal arts colleges. In this spirit, the Franciscan Center for Service and Advocacy calls the entire Siena College Community to respond to the demands of peace, justice and integrity of creation that arise our local region, our nation and our world. Rooted in the Franciscan Tradition and informed by Catholic Social Teaching, the Franciscan Center for Service and Advocacy offers transformational education and formation opportunities for the entire Siena Community that integrate classroom learning with hands on service and reflection among poor and marginalized people. Our goal is to develop in the Siena Community a deeper sense of responsibility and solidarity with the poor and marginalized, in order that we all might become lifelong advocates and servant-leaders. 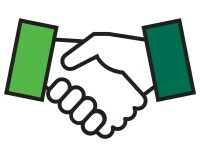 In so doing, the Franciscan Center for Service and Advocacy commits itself to be a model community of Gospel values. 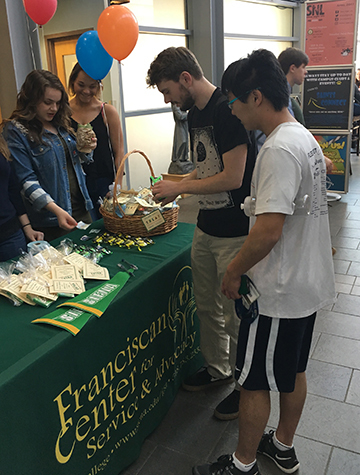 The Franciscan Center for Service and Advocacy (FCSA) promotes and upholds the Franciscan mission of the college by engaging students and the Siena community in various service and advocacy programs, particularly among the poor and marginalized. FCSA offers extensive volunteer and advocacy opportunities with various agencies and organizations in the Capital Region which allow the Siena community to discover, experience, and respond to the needs in our local community and to be agents of change and advocates of justice. At the Franciscan Center for Service and Advocacy, we serve our sisters and brothers first and foremost by sharing in their lives. Siena College’s Catholic Tradition guides all our programming in the Franciscan Center for Service and Advocacy by means of its tradition of Catholic Social Teaching.